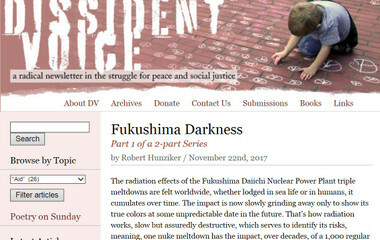 The ongoing disaster at the Fukushima Daiichi nuclear power station (FDNPS), operated by Tokyo Electric Power Company (TEPCO), since 11 March 2011 can be recognised as part of a global phenomenon that has been in development over some time. This disaster occurred within a social and political shift that began in the mid-1970s (ed. supply-side economics, which is strongly reflected in America’s current tax bill under consideration) and that became more acute in the early 1990s in Japan with the downturn of economic growth and greater deregulation and financialisation in the global economy. After 40 years of corporate fealty in return for lifetime contracts guaranteed by corporate unions, as tariff protections were lifted further and the workforce was increasingly casualised, those most acutely affected by a weakening welfare regime were irregular day labourers, or what we might call ‘informal labour’.